Castor oil is made from the pressed seeds of the castor bean plant, botanically known as Ricinus communis. The plant is native to Africa and other tropical regions. It’s generally considered safe to handle, but it can be deadly if ingested as it contains toxins known as ricin and ricinine. The use of castor oil dates back thousands of years in many different cultures. Ancient Egyptians would use it as a fuel for lanterns and in the treatment of eye infections. It’s also a common remedy in Ayurvedic medicine for poor digestion and skin problems. Castor oil is a colorless liquid with a very strong scent and it’s often used as an ingredient for a wide variety of things like soap, hydraulic and brake fluid, ink, plastic, wax, polish, pharmaceuticals, perfume and paint. 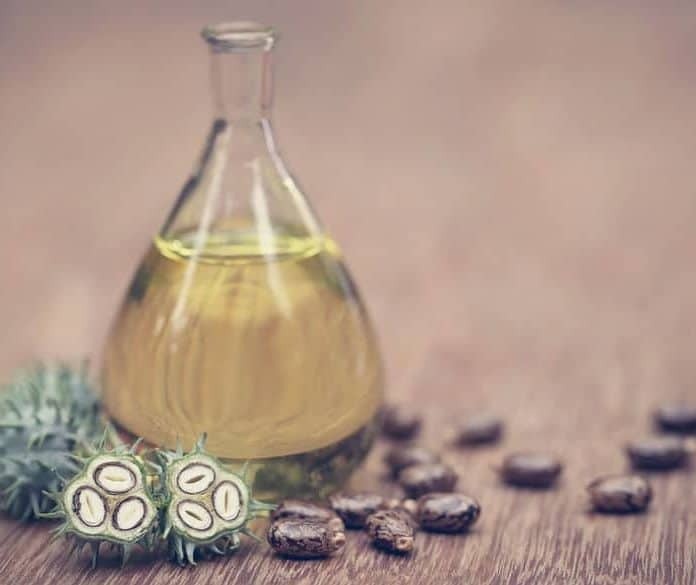 Castor oil is a vegetable oil, and it contains large amounts of essential fatty acid chains such as ricinoleic acid, oleic acid, linoleic acid, palmitic acid and stearic acid, among others. There is no fiber, protein or carbohydrates in castor oil, and any calories found in the oil come from fat. Castor oil is rarely thought of as an effective ingredient in beauty products, but in its pure form it can replace a number of things in your beauty cabinet. Here are 10 beauty benefits of castor oil. Castor oil can work wonders on dry skin, which is an uncomfortable skin condition that affects everyone in different ways. Often, it’s characterized by itching, redness and cracked skin. Dry skin is caused by a variety of different things like lifestyle choices, the weather and genetics. Castor oil is hugely beneficial when treating dry skin, and other skin conditions such as dermatitis and eczema, because it is a natural emollient. An emollient is simply a cream, oil or ointment that has the ability to soften and soothe the skin. Emollients can also provide moisture and prevent the skin from cracking. These emollient qualities found in castor oil make it a cheap and effective dry skin treatment. Castor oil can also aid in the treatment of dermatitis (a very severe form of dry skin) due to its antifungal and antibacterial properties. Some varieties of dermatitis can be caused by contact with something that causes an infection or allergic reaction. The antibacterial benefits of castor oil can counteract this and ensure that infection can’t spread to other areas of the skin. To use castor oil on dry skin, it’s best to perform a patch test beforehand. While allergies to castor oil are rare, they can occasionally occur. To apply, simply massage into the affected area. If only a small patch of skin needs to be treated, you can also dip a cotton ball into some castor oil, then place onto the skin and fix a band aid over the top to hold it in place.